Make the crust In a food processor, pulse the 2 1/2 cups flour with the sugar, rosemary and salt. Add the chilled butter and beef suet and pulse until the mixture resembles coarse meal. Drizzle the ice water over the top and pulse until the dough just starts to come together. Scrape the dough out onto a work surface, gather up any crumbs and knead until the dough is just smooth. Cut the dough into 4 pieces and pat into disks. Wrap the disks in plastic and refrigerate until well chilled, about 1 hour. Preheat the oven to 400°. Line 2 large rimmed baking sheets with parchment paper. On a lightly floured work surface, roll out each disk of dough to an 8-inch round. Transfer the rounds to the prepared baking sheets and dust with flour; refrigerate for 15 minutes. Make the filling In a large bowl, toss the plums, sugar, thyme, cinnamon, salt, nutmeg and pepper. Spoon the plums and some juices into the center of the pastry rounds, leaving a 2-inch border. 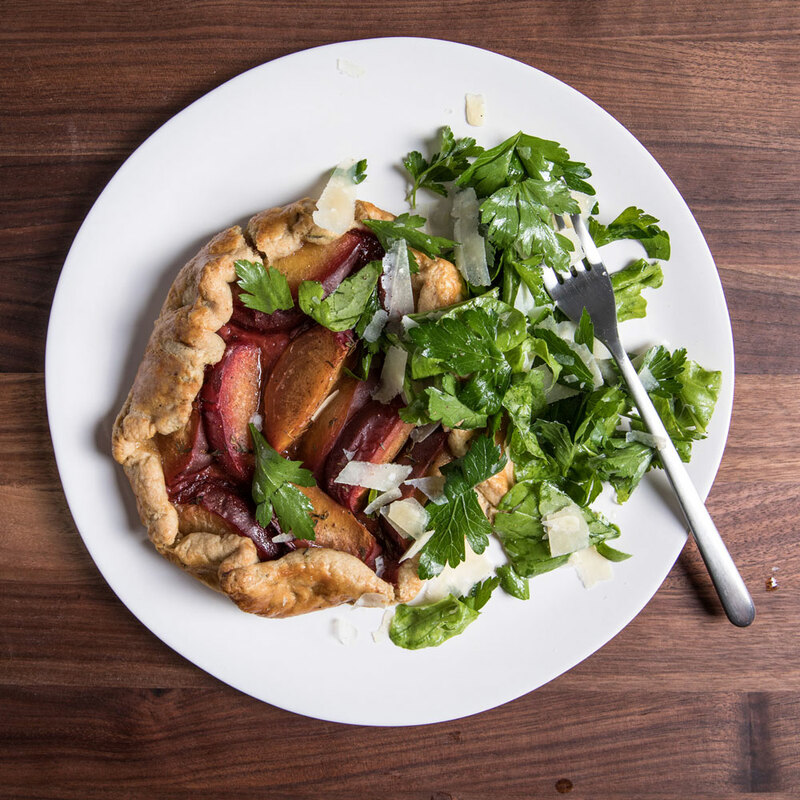 Fold the pastry up and over the plums and brush the rims with the egg wash. Bake the tarts for 40 to 45 minutes, until the crusts are browned and the plums are just tender; rotate the pans halfway through baking. Let cool slightly. The tarts can be tented with foil and stored at room temperature overnight. Warm in a 400° oven for about 10 minutes before serving. Beef suet is the fat that encases the kidneys. Look for it in the supermarket freezer aisle or at your local butcher shop. Review Body: I am a arugula salad fan, will definitely try this one!